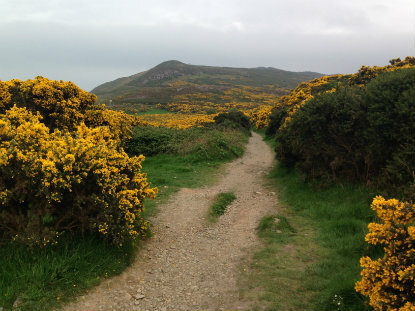 When I stepped off the train in the Irish coastal town of Bray, I had no idea what to expect. My heart was longing for the outdoors so much that I only knew I was going to someplace that others said was beautiful. As I wound through the alleys and broad roads to get to the beach, the tranquility of the town wrapped me in its arms. As I stepped on the stone beach and looked out as far as the overcast sky would let me, I pretended I could see Wales and that I'd just sailed in on a wooden cargo ship. Slowly, my mind—which had been so busy and full in the previous months—began to empty. I by-passed the walkway full of others seeking respite in the beauty of nature and trudged along the beach until I came to the trail. Bray to Greystones. I made it about five hundred yards in before I found a quiet piece of grass over looking the Irish Sea and promptly fell asleep. Upon waking, I started exploring—coast, high hills, covered trails, grassy plains and fields covered in wildflowers. These all seemed to open me up and drain the worries from my mind. As I dreamed and thought, chatted with others and prayed, I began to feel more like myself again. Yes, the hiking was superb. The views, fantastic. And all of that rolled in together to make one unforgettable experience. So, when I strolled into Greystones just after dark, I knew that Irish walk had made an supreme impact on me. In the midst of gloomy weather, a ray of sunshine on my soul.